Some branches of western medicine say that the Alliums have specific health benefits; garlic is respected, at least in allopathic medical circles, as a natural antibiotic. In recent years, while the apparent cardiovascular implications of vegetable Alliums has been studied in some detail, the clinical implications of onion and garlic consumption from this point of view are still not well understood. Will talk about some more facts tomorrow's post. Coming to out today's post. 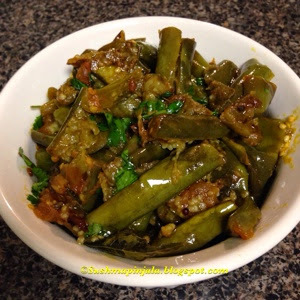 For day 2 under No Onion Garlic food, am here with another simple and yummy dish made with long green brinjal. This dish is usually made with sliced onion, chopped garlic and lots of coriander. As the theme is to cook without onion and garlic, I replaced onion with tomato. Believe me I loved this version of the curry than the one with onion and garlic. Once the oil is hot add mustard seeds. Let the mustard seeds crackle then add cumin seeds, chana dal, curry leaves and slit green chilies. Saute for few seconds and add chopped tomato. 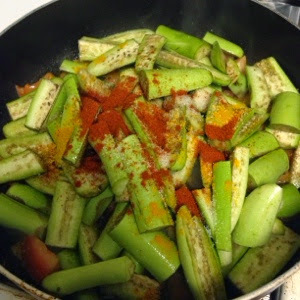 Add turmeric powder and let it cook on medium flame. Meanwhile cut the brinjal's into 1 inch lenth pieces. Cut and drop them in water as they tend to change color become bitter if u leave to air. When the tomatoes are cooked add the brinjal pieces which are resting in water. Now add chili powder, coriander powder and salt to taste. Mix well and cook on low to medium heat until the brinjal pieces become soft. These type of brinjal's cook faster than the regular purple brinjal's. 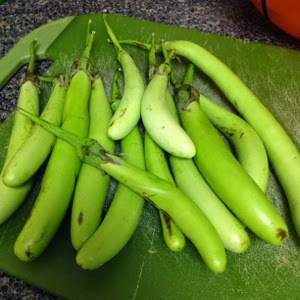 Once done add cilantro and serve hot with rice as a side dish or serve hot with roti. Brinjal looks yummy sushma! My fav too.. I do this way in some festival days where I wont't use onion and garlic. Not an eggplant fan but it is nice to see how you modified the recipe to suit the theme. Such a fingerlicking curry, looks too delicious, i never cooked eggplant without onion and garlic, will try soon urs. 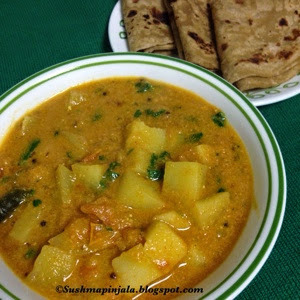 Good recipe Sushma and I enjoyed reading about the vegetables you have written..
A delicious and tempting brinjal curry. That is one yummy looking eggplant curry. Love those long green eggplants, where did you get them? It really Awesome, Brinjal curry is my favorite one. you made it in a Healthy way. garlic is very healthy for the body. Thank you for sharing this process.